Gameopolis is the network to promote and link the Greater Manchester video games industry. We operate approximately from Macclesfield in the south to Lancaster in the north, with Manchester at the centre. Our mission statement is simple – “Make Greater Manchester the centre of the UK video games industry”. We organise regular large Gameopolis events with relevant speakers, and help coordinate events from other organisations such as BFI, Creative England, TIGA, MIDAS, Greater Manchester Councils etc. Our website features profiles of local development companies and publishers, and service companies such as venues, technology, 3D rendering, audio, etc. We also feature job vacancies and information on the area. We act as a focal point for the games industry in the area and also the standard bearer to represent GMCR for inward investment and encouraging people to set up new studios here. Why “Gameopolis”? In the 19th century Manchester was nicknamed “Cottonopolis” as the centre of the cotton industry. In the 21st century we will make Manchester the city of video games, hence “Gameopolis”. The monthly WA Games meet-up at Warrington’s Pyramid Arts Centre with great talks and over 30+ people attending each month. Warrington boasts studios from Codemasters, Rebellion, and D3T on its outskirts so there is lots of talent in the area. 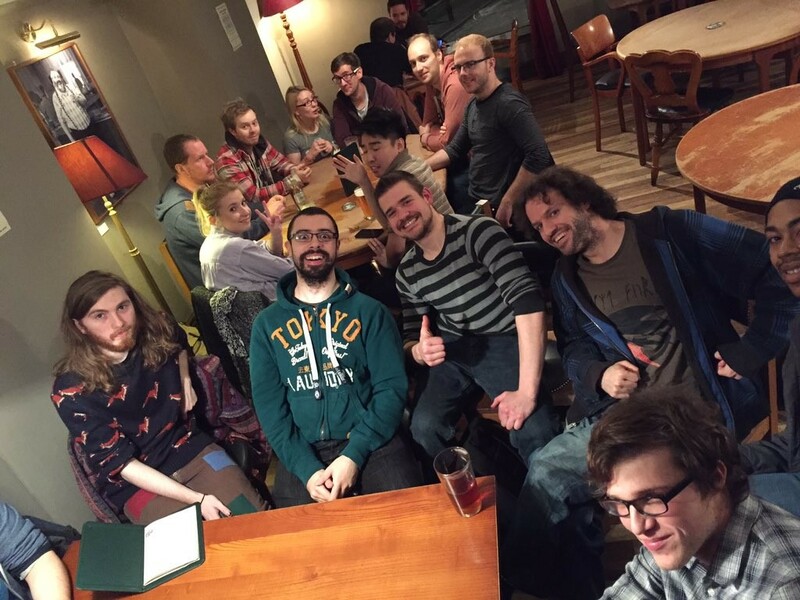 Social meet-up for local game developers on the second Tuesday every month.